Welcome to the AIGC website. AIGC is the oldest and largest national providers of scholarships and services to American Indian and Alaska Native students. This website contains valuable information about scholarships resources, opportunities and overall higher education. My peers on the AIGC Board recently elected me the Board President- an honor I take to heart. I am personally committed to championing higher education for Native students, just as my family did during my educational journey. 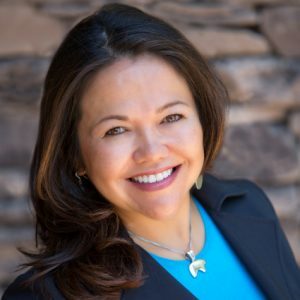 I’ve had the opportunity to work at the national level for most of my career and much of my effort has been directed at being an advocate and voice for Indian country on various tribal issues in Washington, D.C. Through this work, I often get to work with other Native Americans serving in various capacities: attorneys, high-level policy makers, lobbyists, congressional aides, political appointees, and the like. Many of these people are AIGC alumni and received funding and support from this great organization! This tells me that making higher education achievable for Indian students is working, and I’m proud to say AIGC has played a significant role in that. However, there is always more work to do: more scholarship money to raise, more services to first generation Indian college students- the list goes on. Much of my career has been spent advocating for underrepresented groups. I take on this new opportunity as the Board President with an open mind and heart. AIGC is nearing 50 years and has provided over $200 million in scholarships and services to more than 13,000 students. With your help, we can do even more!